Strictly speaking, a stereo microscope is also a compound microscope, because it too is made of an objective and eyepieces. Stage plate: Te specimen is placed here. It should be large enough to hold the specimens that you want to look at. 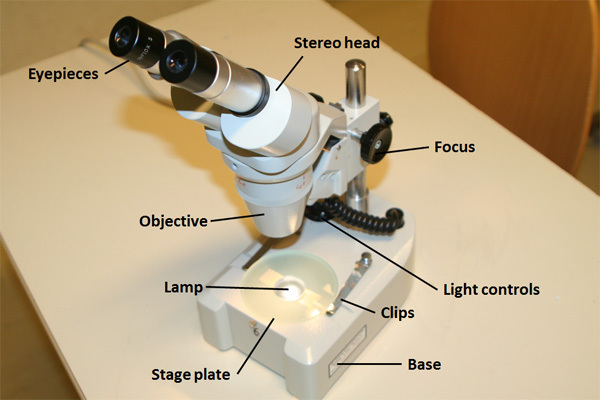 Stereo head: There are two eyepieces mounted to a stereo microscope. The stereo head holds the eyepieces and contains prisms which turn the image rightside up. Eyepieces: These generally magnify the image 10x. Objective(s): A conventional stereo microscopes work like binoculars and have one objective for each eye. It is possible to rotate the tube to get different magnifications. Focus knob: The focus knob raises and lowers both the objectives as well as the eyepieces. This is a difference to the compound microscopes, where the stage is raised and lowered. Lighting controls: Many stereo microscopes have both top and bottom illumination. The light intensity can also be controlled.